To do great things, sometimes you have to break the rules. That’s why we reinvented Surface Pro so you can reinvent everything else. Surface Pro 4. The tablet that can replace your laptop. More powerful and lighter than ever before at 1.69lbs (766 grams). 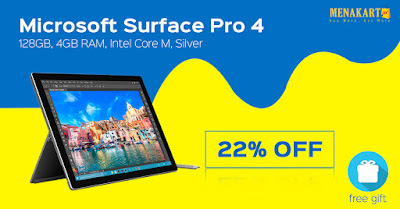 Surface Pro 4 is the most versatile and productive device you’ll ever use. With the multi-position kickstand and an improved Type Cover,1 it transforms into a fully functioning laptop running desktop software.